Action Lab is really putting a lot of effort in The Danger Zone, their mature reader’s imprint. 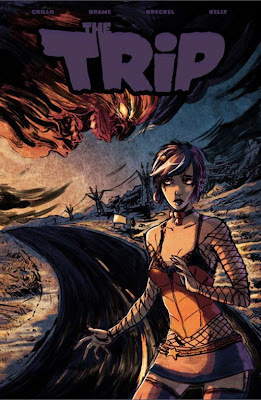 We’ve already reviewed the first issue of “Ehmm Theory” and today we’re going to look at the graphic novel “The Trip”. Action Lab sent a digital review copy to us last week, but it wasn’t able to sit down and read all 96 pages until the weekend. The Trip is written by Jesse Grillo with art by David Brame, colors by Heather Breckel, and letters by Cary Kelley. The story involves a group of college students who try a Native American drug that forces them to unlock their deepest fears. The full book will run you 14.95 and is currently available for pre-order. The first issue of Ehmm Theory had a quirky humor to it like it was an episode of Tales from the Crypt; The Trip is a 1970s grindhouse flick. It feels gritty and dirty in all the right ways. It isn’t a nice story; it’s full of drugs, gore, and abuse issues. There is a scratchy-ness to the art that fits the story perfectly. The pages where the characters are hallucinating look amazing. My only complaint is even at 96 pages it felt a little rush. Once the drug really kicks in things escalate pretty quickly and I would have liked to see a bit more build up. That’s a small criticism though; the Trip is an enjoyable one. The Trip is not going to be a book for everyone, it lives up to that mature reader’s tag. If you’re a horror fan it is a book you should check out.